Want to grow in prayer? A practical guide for growing in prayer, this manual based on the 24-7 Prayer Movement shows how absolutely anyone can pray like never before. 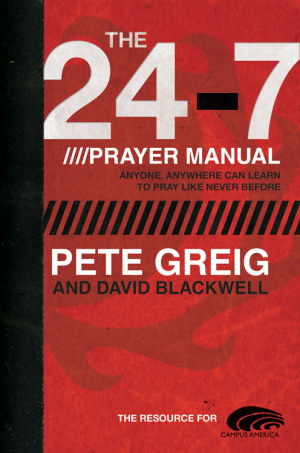 24-7 Prayer Manual by David Blackwell; Pete Greig was published by David C Cook in May 2018 and is our 6958th best seller. The ISBN for 24-7 Prayer Manual is 9781434766175. Be the first to review 24-7 Prayer Manual! Got a question? No problem! Just click here to ask us about 24-7 Prayer Manual. A spiritual revolution is sweeping the world. Ignited in a small one-room environment in England, the impact is transcending borders, languages, and cultures. The continuous prayer movement is reigniting the church and redefining the possibilities of ministry.